Change for a (Sand) Dollar: Get the Beach Without the Kitsch! I might be taking the concept of “summer vacation” to a bit of an extreme this year. I just got back from a great visit to New York, where my son got a look at his future college home. Now my family is already prepping for another trip. This time it’s Florida, to celebrate my parents’ 50th wedding anniversary. That celebration will be a big part of the trip, but you can bet that while I’m there, the beach will be calling my name. There’s something about the coast — the feel of the sand; the color of the sky; the sound of the water lapping up onto the shore. All those things combine to deliver an experience that’s not like anything else. It’s no wonder so many people want to bring a bit of the beach back home with them. But there is definitely a wrong way and a right way to do that. The wrong way copies the beach. The right way evokes the beach. There’s a way to give a coastal feel to a space without over-doing it. If you live in a landlocked state like Missouri, you don’t see a lot of starfish lying around. If you try to bring in too many of those iconic “beach pieces,” your room can start to look kitschy. 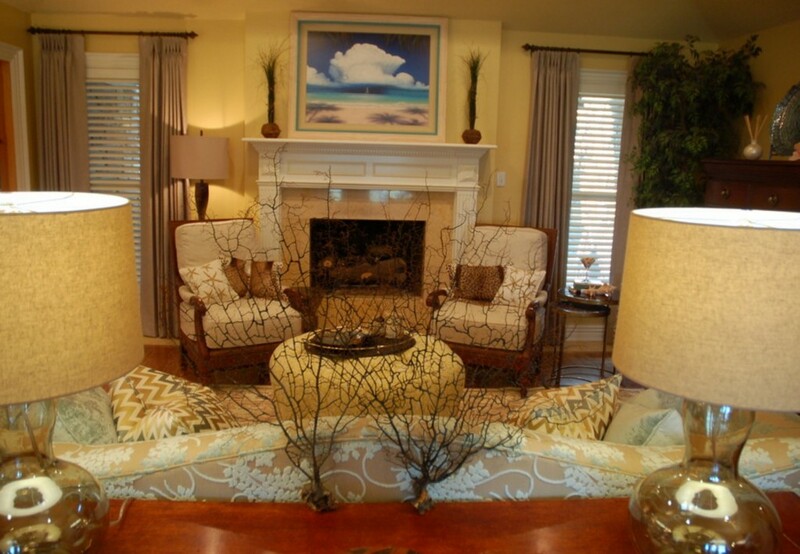 Unless you’re really going for a full-on theme room, you can have that beach feeling in your house without making it look like you just walked into a prop studio. Instead, it’s about how the beach makes us feel. As for me, I feel relaxed. I like the sounds and the colors. It’s serene. If that’s how the beach makes you feel, too, translate those feelings into your room. It could be color. It could be texture. It could even be whole-house audio that allows you to play the soft sound of waves, or relaxing spa music, to evoke those feelings. Don’t you love it when your personal tastes happen to be trendy? If you want a piece of the ocean in your life, you’re in luck, because current design trends are really conducive to a beach-inspired home. Neutral colors are strong: not just grays, but warm grays and gray-beiges (think sand), and a variety of blues–from a bold turquoise to an almost-white blue. That makes it a lot easier to find pieces that fit the mood you’re trying to create. And you can mix those colors together because they’re appropriate. If you find them together in nature, chances are they’re going to work out great in your home. 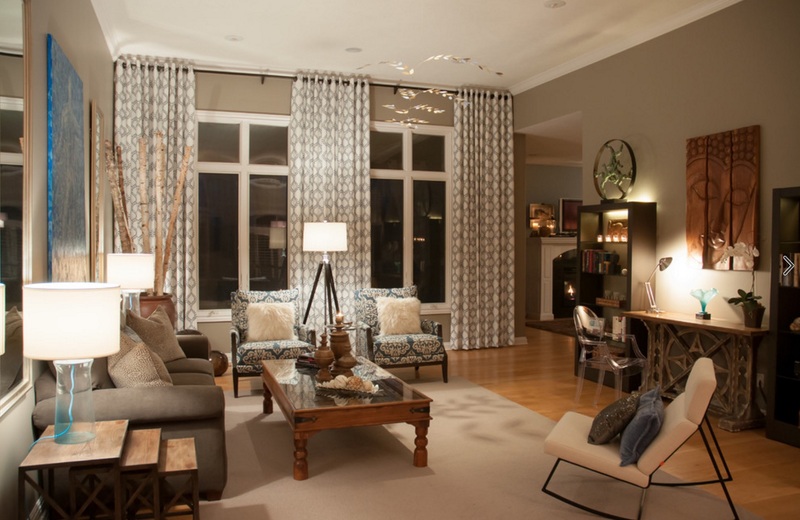 Anchored by that neutral color, you can add a dash of creativity. Bring warm and cool colors together. Maybe a grayed wood flooring — similar to driftwood — against a warm, camel-colored sofa. Think about the white sand. The beach vegetation. Maybe add some greenery. Live plants in a living space go way beyond a “design” function. They also help clean the air and just give your room a pleasant feeling. The beach is rich with texture, and I’m not just talking about the sand that sticks to everything. Pieces like a natural woven rug can provide a jumping-off point for that texture. Linen, natural wood, or crewel embroidered pillows are good options for beach-themed spaces, too. I really love the textures in the above photo, from one of my own projects. The owners spend half the year on the water, and the rest of their time in their home in Arkansas. They wanted to bring the beach home with them, but in an appropriate way. The warm, natural wood table-top has a “driftwood” feel. The cube stool brings another texture. The grasscloth wallpaper evokes the sand in color and texture (and I love the design as much as the texture). Even the smooth mirror brings a sense of the reflection on the water. We used several different blue tones, and brought in some yellows from natural foliage. 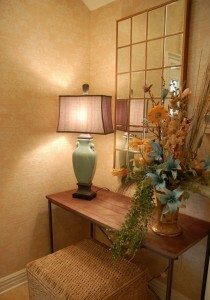 And the metals in the mirror and the lamp help offset some of the warm tones. I love this space because it’s balanced. All the elements are there. Air is the space itself. Fire is in the light of the lamp. The water is present in the blue and the reflection of the mirror. The wallpaper and the cube stool evoke the earth. Victoria at SF Girl by Bay had a recent post that included a lot of interesting textures to evoke the look I’m talking about here. She followed it up with links to some “beach-worthy” items to help you achieve the look. There’s more than one way to bring the beach into your home. Here’s another project: a completely different look and feel, but it also delivers the coastal vibe. The room is open and airy. There’s a beachy theme going on here, but it’s not quite as obvious. The linen curtains. The natural-neutral color of the rug. The texture of the wood on the table in the foreground. The liberal use of blue. It all adds up to a room that would be at home in a beach house, but doesn’t look out of place in the Midwest. 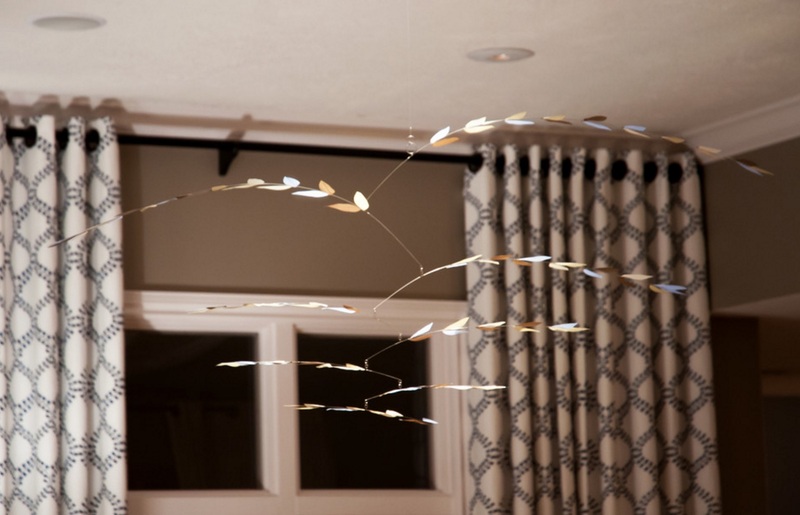 Oh, and one other piece I love about this room: the “aerial art” on the ceiling, made of copper and silk. It was commissioned from an artist in Colorado. We put a spotlight above it, and it casts a shadow on the floor. 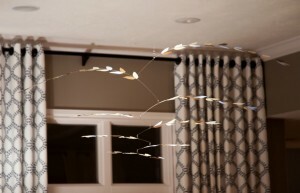 Just like the wind and the waves are always moving at the beach, this room has a constant motion, as well. If you want a look at some different options to bring the blue of the beach into your home, here’s a good source: Design Sponge‘s recent post Moody Blues: 11 Blues for the Home might help get you started. The point of all this is that you probably aren’t trying to re-create the entire beach experience. If you are, I recommend a sandbox and some suntan oil. So instead of trying to re-create the beach, think about why you love it. Think about how it makes you feel. Think about why you want to go back. If you can bring those things into your home, you’ll have a beach vibe you can love forever.